introducing...wasabicam!, a photo by Crunchy Footsteps on Flickr. 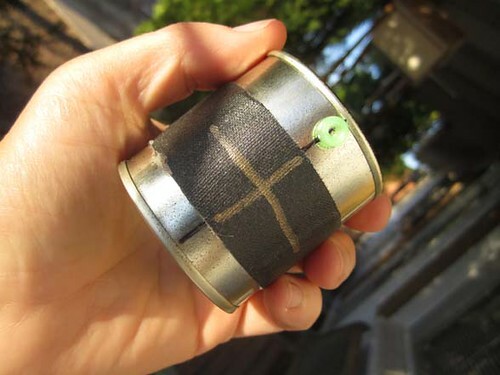 I made a camera today in honor of Worldwide Pinhole Day, 2012, which is tomorrow! Meet "wasabicam"! It is made from a little wasabi powder container. It has a great light-tight lid, and a nice focal length for it's relative size. It takes a little paper negative that is 3 inches x 1.625 inches. The pinhole is .012 inches- the smallest size drill bit that I have! Phew! I am looking forward to putting it through it's paces tomorrow for WWPD 2012!